Front view of Mr Brett's house at Hosur, near Bangalore. bl.uk > Online Gallery Home	> Online exhibitions	> Asia, Pacific and Africa Collections	> Front view of Mr Brett's house at Hosur, near Bangalore. 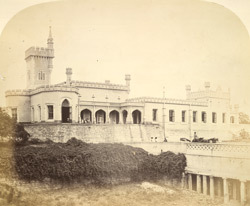 Photograph of a general view of the house known locally as The Castle, from the Archaeological Survey of India Collections: India Office Series (volume 21, 'a' numbers) taken by Henry Dixon in the early 1860s. Built in the form of a mediaeval castle by the Collector Mr Brett (1859-62), this building served as the divisional officer's 'bungalow'. It was purchased by the Government in 1875. The family group gathered on the verandah is possibly the Bretts.